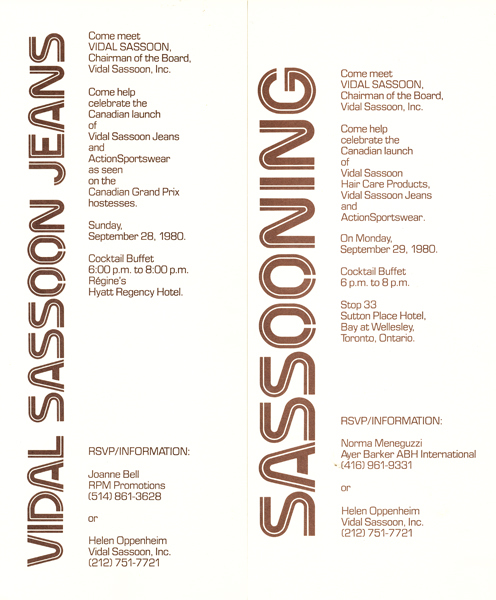 Here are two invitations, to the Vidal Sassoon press event launches for the hair care products and the jeans in Canada, in 1980. The Montreal event was first, on a Sunday! 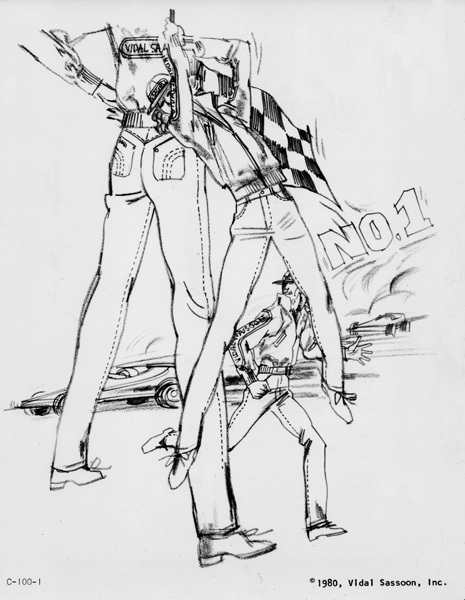 Vidal Sassoon helped sponsor the Canadian Grand Prix and the hostesses wore the jeans of course. Then, there was a Cocktail Buffet with a little fashion show at Régine’s, which was very hot then. We all left for the Toronto event very early Monday morning, to be in time for a WWD interview at 9 am and we spent 2 days there, one interview after another, including at all meal times. The Toronto Cocktail Buffet was on Monday night at Sutton Place Hotel and photos can be seen in this album from that event. Vidal was up very early on Tuesday morning to go out of town for a 7 minute interview on Canada AM, which included him doing yoga! And he did interviews the rest of the day, until 4 pm, when I had booked him a requested massage. Both he and I flew to Toronto, for a lunch, for one important interview later and all radio interviews were done later. I worked with a PR in Toronto and two PR’s in Montreal and from my office in NYC where I worked with two assistants on these events. 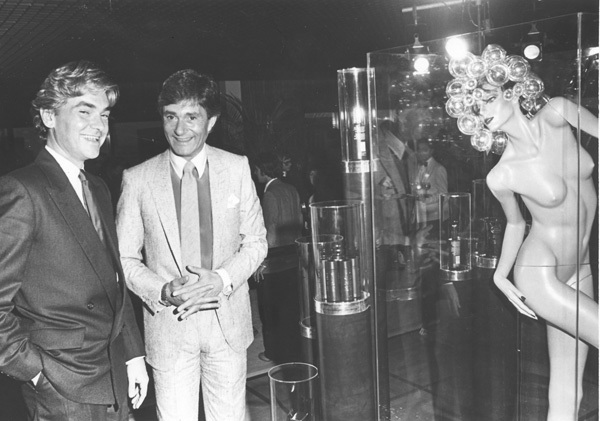 One of the important things that made Mr. Vidal Sassoon so successful and special was he expected a lot. And he got a lot. Interviews were all pre-planned and approved of before the press events. Vidal Sassoon and his Million $ Jeans Here’s Vidal with his Million $ Jeans model at the Toronto Press Event to launch his jeans and his hair care products in Canada. This was the ultimate pair of jeans and this photo made not only the NY Post but also the NY Daily News and the United Press International Wire Service for world wide coverage, but also many papers in Canada as well as the US. As PR director for the Vidal Sassoon Salons USA and Canada, I had spent two weeks of sleepless nights trying to come up with a newsworthy idea to launch yet another pair of jeans and one night a brainwave came. Why not have the Vidal Sassoon logo made of real diamonds and have a Pinkerton security guard standing by to protect what I called the Million $ Dollar Jeans. I had a contact with the Canadian PR for de Beers Diamonds, at Ayer Barker ABH International in Toronto, and I approached Heather. She liked the idea for De Beers, too, and had the signature made of De Beers diamonds, albeit not a Million $ worth, but I think we paid some $15,000 for the signature, which in 1981 was worth a lot more than it would be now. Yes, it was a gimmick, but a good one. I was surprised how many of the press thought they really were worth a million dollars but most knew and played along with the fun! 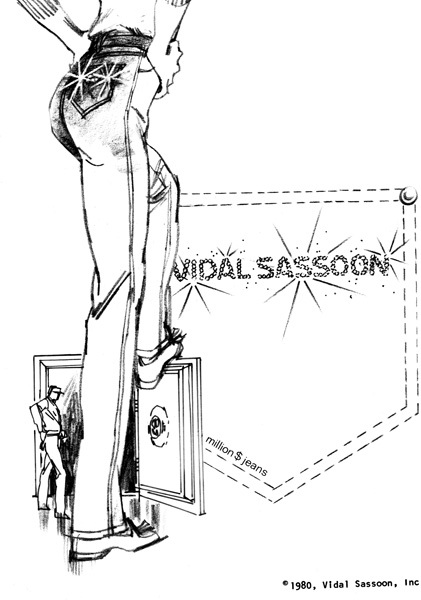 Jeans manufactured in Montreal by Skirt Togs for Vidal Sassoon Canada Ltd. 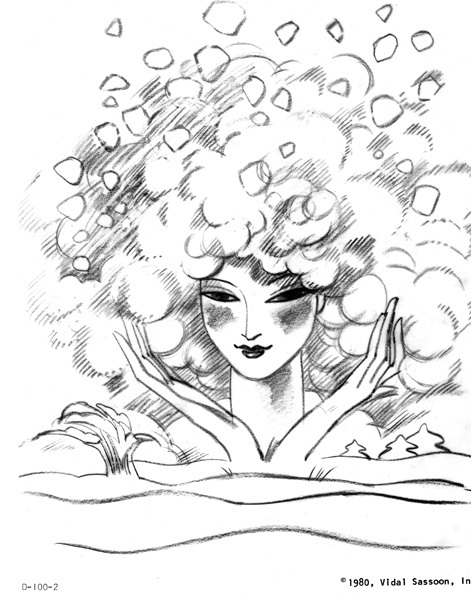 There were hairstyle photos in the press release, but repeats of others in the Vidal Sassoon Archives so I show just some of the photos and sketches from the Canadian Launch. Here’s the Million $ Jeans with a real Pinkerton security guard, complete with gun. We hired one in Toronto, shown here, and another in Montreal for the jeans fashion show and event we held there the previous day at Régine’s, which was followed the next day by the jeans at the Montreal Grand Prix where 50 hostesses and pit girls flashed and dashed about in Vidal Sassoon jeans and tops. This was a major PR effort on my part, which I handled from my NY office with Norma Meneguzzi of Ayer Barker in Toronto and RPM Promotions in Montreal working with Lawrence Taylor of Vidal Sassoon in Century City in California. 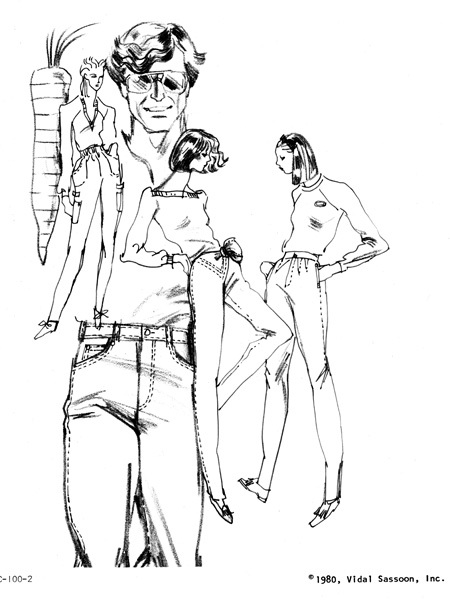 The jeans were manufactured in Canada by Skirt Togs in Montreal for Vidal Sassoon of Canada Ltd. Hair: Helen Chudoba, Vidal Sassoon, Toronto, 1980 … Model : Paula Turnbull, International Top Models … Photographer: Unknown. The Million $ Jeans were kept in a safe when not in use. ANECDOTE: Actually, the diamonds were attached to just a pocket. and why we included an orange paper carrot with the press release. The jeans manufactured by Skirt Togs in Montreal for Vidal Sassoon Canada Ltd.
of them, can’t remember which now, shot up to No. 2 in their category in Canada. jeans were not the area of expertise for a hair product company. and tops and the Montreal Grand Prix in 1980. Jeans manufactured in Montreal by Skirt Togs for Vidal Sassoon Canada Ltd.
and everyone thought that was us, so I guess the Powers That Be saw an opportunity. Re-Moisturizing Creme, Seal & Protect with Finishing Rinse. in brown and silver, and were a big success in the US, the UK, Europe, Asia and South America. jeans) – see here with Peter Laurance who designed the display.